Not so long time ago I was asked to integrate Facebook ads in a project. Without having done so before, I prepared myself for a potentially long process, even a little bit painful, and then I got started searching the docs. Against my initial thoughts though, I went through the docs pretty fast, and after a few minutes I had my first Facebook ads up and running! Facebook ads consist of a nice way to embed advertisements in your apps and make some money out of them if they gain significant visibility. 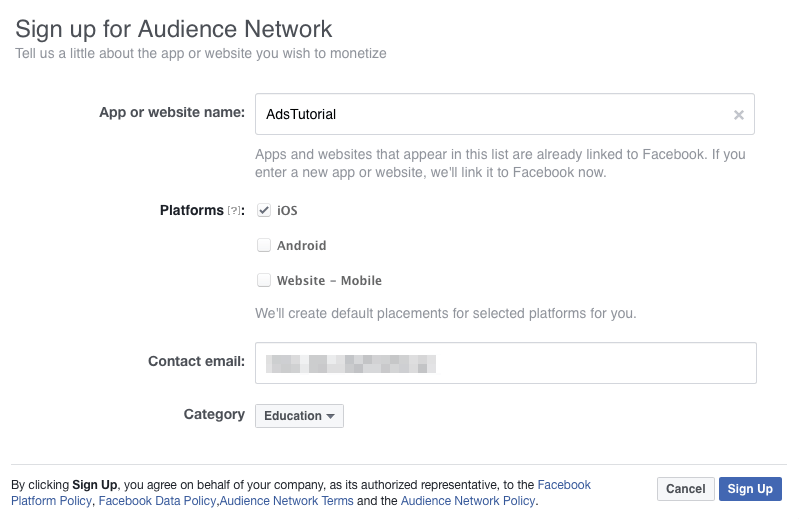 The process to get there (to embed ads) is not complicated at all, as Facebook SDK (an SDK with frameworks made by Facebook) contains an ad-related framework called Audience Network. 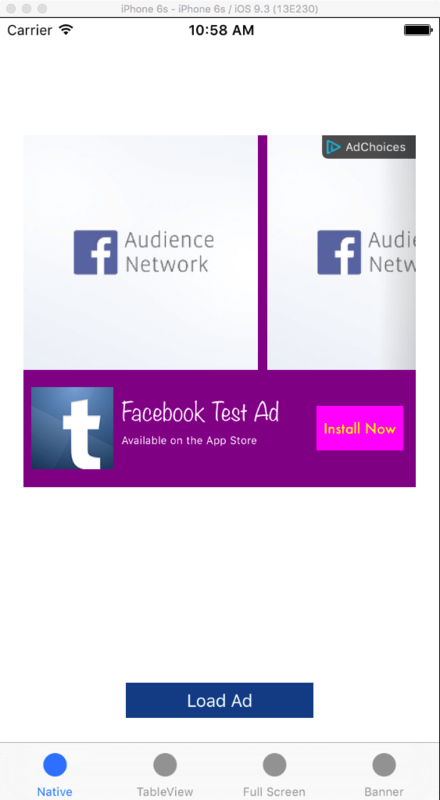 That framework is pretty much all you need for having ads being served inside an app. Native ads can be placed anywhere in the app, and the views that they appear to can be customised so they do not distinguish from the rest of the UI. Those views are either manually created views (custom controls that are assigned with an ad’s details), or a view template given by the Audience Network Framework that has certain attributes for customisation. However, a special and interesting case is when you want to display ads in a tableview, where you have two options: Either you create your custom views (in that case custom cells) that will contain the ads and you perform all the related tableview handling manually, or you use some specific classes from the Audience Network Framework (real gems) and you get the tableview handling almost for free. The drawback here is the fact that you lose the option to customise the appearance of the ads, but in several cases that’s not a problem at all. Interstitial ads are actually full screen ads, and as you understand, they hide the entire content of the app when they’re being displayed. Therefore, no need for customisation here regarding the appearance of the ads. Banner ads are small views that usually appear either to the top or to the bottom of the screen, but no customisation is allowed here as well, except for the height of the banner. We are going to go through all the above cases in this post together, but besides that, I will also show to you how to make the necessary required configuration to the Facebook Developers portal. Actually, I will guide you to the configuration needed to make the app capable of showing ads, and for the rest (providing information, payout info, etc) I will give you just one, ancient advice that’s always true: Read the documentation (also known as RTFM). 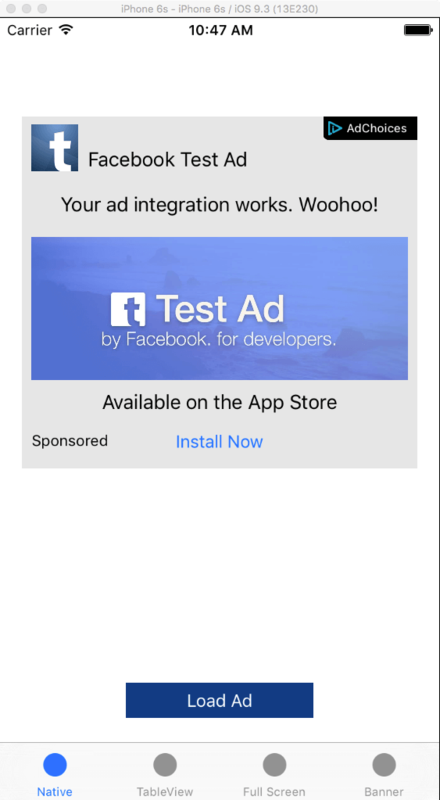 You may be wondering why I decided to write a tutorial about Facebook ads when I admit that it’s easy to integrate them in an iOS app. There are two reasons for that: Firstly, as I found almost nothing on the web to get me straight into the point, I considered to be a good idea to give you an immediate how-to guide so you can have ads being served in your app in no time at all. 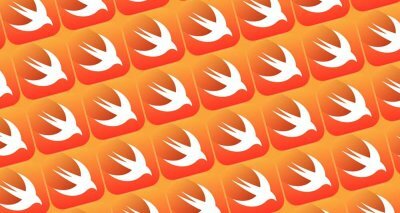 Secondly, all the sample code you can find on Facebook docs is written in Objective-C, so new developers that know about Swift only and not Objective-C will probably encounter some problems to “translate” the code from one programming language to another. Lastly, and just for the records, keep in mind that the demo project that I’m about to present right next and you can download was made in Xcode 7.3.1 and Swift 2.2. That’s the official version still for both, so don’t start complaining if something doesn’t work in Swift 3.0. There’s not even one programming topic that can be explored and learnt without getting your hands dirty, so a demo app is accompanying this tutorial too. This app is simple and suitable in order to focus on how Facebook ads can be embedded to a project. You will begin by a starter project that you can download here, which we’ll make more and more complete as we move on. The view controller behind the first tab is called SingleAdsViewController, and here we’ll talk about the native ads. Not only we’ll see how we can use custom views to show an ad’s details, but also we’ll see how we can use a template with attributes that can get overrode instead of creating custom views. Next, in the second tab there is the TableViewAdsViewController. Here we’ll see how native ads can be integrated into a tableview, but by using additional tools that the Audience Network Framework gives us. If you download and run the starter project, you’ll find some sample data already contained in the tableview. Our goal is to display the ads between the rows of the currently displayed data. In the third tab a new view controller exists, called FullScreenAdsViewController. This is the place where we’ll display a full screen ad simply by tapping on a button. Lastly, the BannerAdsViewController view controller lies behind the fourth tab, and as you understand we’ll see the details of the banner ads there. What we are about to discuss in the next parts is good enough to get you covered in most cases. However, if you want to do some additional fine-tuning or to change one or two details, then you can go deeper by digging the official docs. And actually you should do that in order to have a better picture of the topic! The place you have to always start from when integrating ads is the Facebook Developers portal, because there are actions you have to take in there, and some vital data to fetch as well. Quickly mentioning them, you need to create a new Facebook app and then do some configuration, with ultimate goal to get some unique identifiers that will be used for the ads that will be displayed in your iOS app. Type in the name of your app. 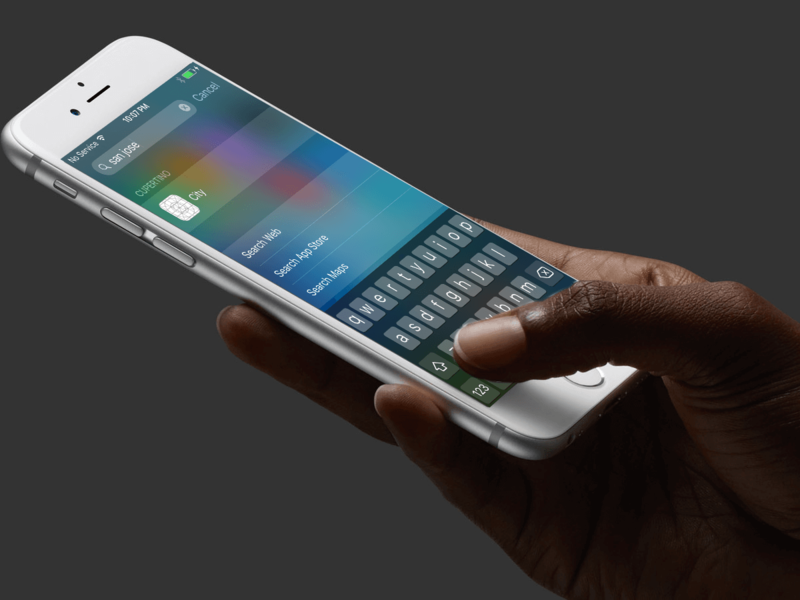 Select iOS as the target platform. Click to the Link to Facebook option that appears while you’re typing the app name. By doing so, a new app record will be created automatically and it will be added to My Apps section in the Facebook Developers portal. It’s important, so don’t miss this step. Once you do so, two additional fields will appear in that form: In the first one provide an email address so they can get in touch with you, and select the best category that your app matches to in the second one. When you finish providing all information, click to the Sign Up button. Then pass the security check and you’re good to go. If everything has been done properly, you will be landed to a settings page, and to the Placements settings of the Audience Network product specifically. There’s something important that has to be done now, and that is to create placement IDs for the ads that are going to be displayed in the app. 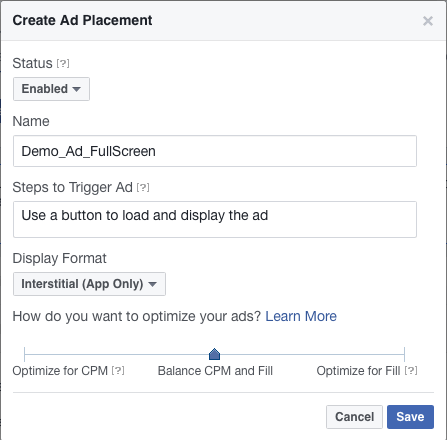 A placement represents the position of an ad inside the app, and by creating IDs for those placements Facebook can collect data for the ads tapped by the users, as well as to make suggestions or optimise the displayed ads. By scrolling the page, you will notice that a placement has been created for you automatically. In our demo app we will need four placement IDs, so we definitely need to create new ones. To do that, just click to the Create Ad Placement button, and get ready to provide some information to a new popup window. The third ad is supposed to be a full screen one. I leave the creation of the fourth placement ID to you as an exercise. For this placement, either edit the one that was automatically added, or create again a new one. Keep in mind that the banner ad will be displayed when a button will be tapped in this case as well. Notice that each new placement gets a Placement ID value once it’s added to the settings page. We are going to use those IDs in the app later. Furthermore, if you just click to the Get Code button you get instantly some sample code on how to use the selected ad and its placement ID. The only drawback: It’s in Objective-C, so you have to convert it to Swift. But don’t worry, this is what we’re going to do next. When you run the app in the Simulator. To enable test ads on a device, add the following line of code before loading an ad: [FBAdSettings addTestDevice:@”HASHED ID”];. Use the hashed ID that is printed to the console when you first make a request to load an ad on a device. In other words, when you run the app on a device a hashed ID value is given to you (printed to the console) for that specific device. You must use that value as the above extract dictates so as to indicate that you want test ads to be served to the device. 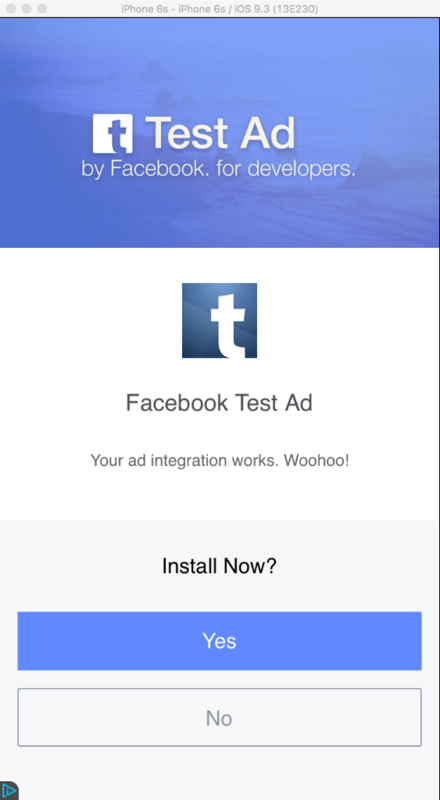 In any other case, your app will request for real ads from Facebook, and you won’t see them at all until a Facebook review team reviews the app. The review can happen right after you publish your app on a public location (like the App Store, or a custom enterprise store) so the review team can download the app. 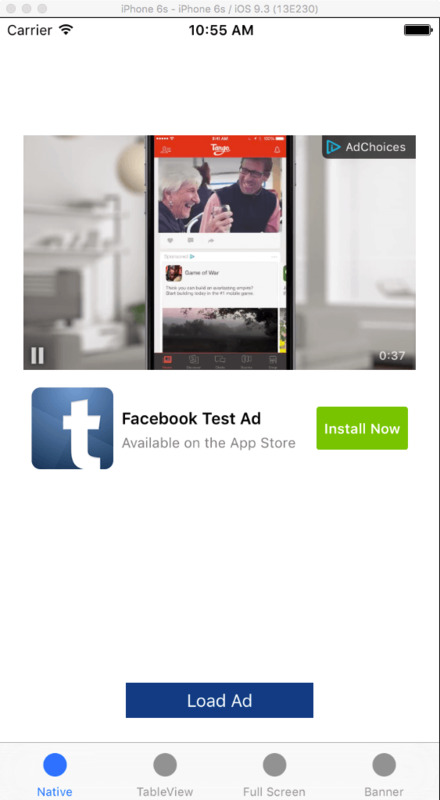 If the app passes the review, then you can have real ads served in the app, otherwise nothing will appear. Furthermore, a textfield to type your app’s URL so the review team gets the app from will appear at the top of the Placements settings webpage in the Facebook Developers portal (it’s also possible that you have that textfield already there). Use that field to type the app’s download URL in (when you have it), and give a couple of days for the review to happen. Also, take a look at the Alerts section of your app on that portal, because you’ll receive messages there. Manually by downloading the Facebook SDK for iOS. In the Set Up the SDK section of this page you can find directions for both options. I preferred to download the SDK, and then drag and drop the Facebook Audience Network framework straight into Xcode. 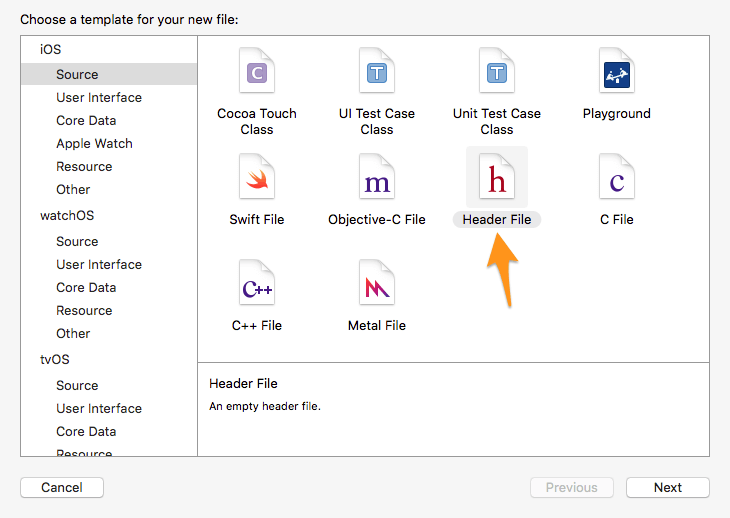 In Xcode, go to the menu File > New > File…. In the file template window, select the Source category under the iOS section. Select the header file from the templates. Name the file AdsTutorial-Bridging-Header.h and save it. Press the Return key, and you’re all set. The configuration has been finished, and it’s time to start implementing now. As I’ve said already, native ads can be fully customised and look similarly to the rest of the UI of your app. And there are two ways to do that. The first one involves the manual creation of all the views and subviews needed to display the ad details. The second one uses a default template where some specific attributes (colors and fonts) can be overridden, and there’s no need to create even one view manually. We are going to see both ways, and we’ll start from the first one in this part. In any case, since there’s almost nothing else displayed in our demo app things are going to be simple and clear. viewAdContainer: It’s the view that contains all other subviews that display the ad details. 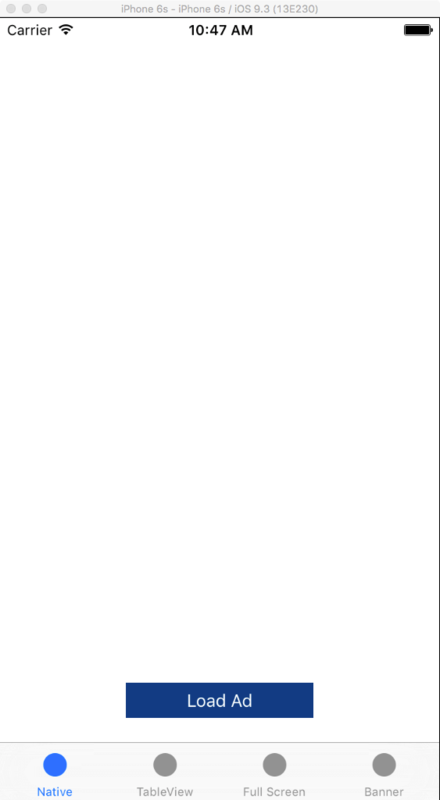 When the app starts, this view is hidden because there’s no ad loaded yet. lblAdTitle: It’s a label displaying the ad title. lblAdBody: It’s a label displaying the ad body text. imgAdIcon: It’s an image view that displays the ad icon. btnAdAction: It’s a call-to-action button that can be used to open the ad details (in full screen mode) once it gets tapped. Alternatively, the whole container view can be used to trigger the full screen ad presentation. I’m going to show both. lblSocialContext: It’s a label displaying the message “Available on the App Store” or something similar. There’s one important thing you should always have in mind when requesting for ads; the most basic fields will always contain a value (like for example the title and the icon). However, other fields may be empty (nil values), therefore you should handle these cases and avoid unwanted crashes. You’ll see that in a few moments. var nativeAd: FBNativeAd! var coverMediaView: FBMediaView! The nativeAd object represents a native ad inside the application, and we’re going to use it a lot during our implementation. Here you can find all the details about the FBNativeAd class. The coverMediaView is a special kind of view (a UIView object) capable of displaying any kind of media an ad might contain, images or videos. This view will be the only one created programmatically, without having a respective visual control in the Single Ads View Controller scene (in the Interface Builder). If you’re curious enough about the FBMediaView, this is the place you should get more information. As usually, the first thing required is to initialise the nativeAd object by using the method shown in the first line. Before you run the app, make sure to replace the “PLACEMENT_ID” string with your own, real placement ID that you created earlier. Just copy the placement ID from the Audience Network settings page (the placement ID regarding the native ad), and paste it here. Next, we set our class as the delegate for that object, and we’ll deal with that shortly. Finally, we call the loadAd() method to make the actual request and fetch an ad. No pre-caching is the default option. For a list of all the possible options, take a look right before the end of this page. It’s possible that you want to do a better error handling than what I’m doing here, but for now just printing the potential error is sufficient. The interesting part is the nativeAdDidLoad(_:) delegate method, where there is a call to a method called handleLoadedNativeAdUsingCustomViews(). It’s obvious, even by its name, that this is a custom method that we’ll implement right away to deal with the loaded ad. Before we do so though, I think it’s necessary to explain and say that we’ll use the exact same delegate method in the next part where we’ll use the ad view template, and we will take a totally different way once the ad is loaded. So, having custom methods to handle each case is almost unavoidable and the best approach to make things clear in the scope of this post. // Set the ad title. // Set the ad body (if exists). // Set the title of the call-to-action button. // Load and display the ad icon image. // Create a cover media view and assign the native ad object to it (it will display image(s) or video, depending on what ad contains). // Set the social context title (if exists). We don’t know for sure if the body or the social context of the ad have actual values, so we must check if they’re nil or not first. If you want to be more than 100% sure, perform this check even for the basic fields. The icon of the ad is loaded asynchronously as shown above. The loadImageAsyncWithBlock(...) takes care of that, and all we have to do is to make sure that an image has been really fetched before we assign it to the imgAdIcon image view. The coverMediaView is initialised and added manually to the container view (viewAdContainer). Notice the use of the clipsToBounds property, which seems to be necessary. If you don’t use it, it’s quite possible that you see the media of the ad exceeding the frame (the width) of the container view. // Add the AdChoices view. The call to the updateFrameFromSuperview() method will assign the proper frame to the AdChoices view, so it’s not necessary to do anything else. Optionally, and since this is a view object, you can set the frame manually. 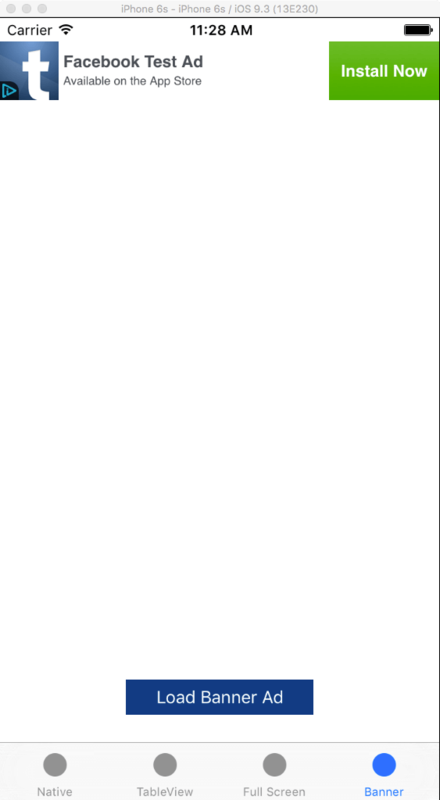 // Use this to make the whole ad container view interact when tapping. // Use this to make the call-to-action interactive only. The last parameter of the above method gets an array of views as an argument, and that means that you can set more controls, and other than the action button to interact when users tap on them. For our demonstration purposes, passing the button as the only item of the array is enough. // Make the native ad view container visible. As you can see, two things have been added right before the ad loading: At first we remove from the superview the cover media view if it’s already there, and we make the respective object nil. If you remember, this object is re-created every time an ad is loaded. At second, if the nativeAd object has been already initialised and contains ad data, then we unregister the view that was registered for interaction (either the entire ad container view, or the call-to-action button) before we load a new ad. That’s necessary, because in a subsequent ad load the proper view will be registered again according to what you have set. More resources about the native ads can be found here and here. 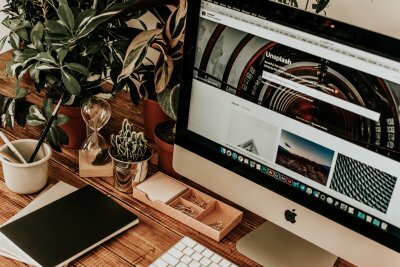 Knowing how to use native ads with custom views, we can go one step further and see how we can take advantage of a native ad template that the Audience Network provides. With that, there’s no need to create any views manually and assign any ad details to them like we previously did. All you really need is to specify the frame of the ad view (that view will be created automatically), and to make any potential configuration regarding the colors and fonts of the displayed items. We meet for first time a new class here, the FBNativeAdView. As its name suggests, its role is to create a view for displaying the details of a native ad. It’s clear that all it takes is to initialise such a view, set its frame and then just add it to the view that you’d like to be contained into. The last line simply registers the newly created nativeAdView to the native ad object, so there’s interaction when the user taps on the ad. Apparently, the height of the view should match to the view type when setting the frame. For example, if you set the GenericHeight120 as the type of the native ad view, then you should change the frame accordingly and set the height to 120.0 points. This one has one additional parameter (withAttributes) that expects a FBNativeAdViewAttributes object. By providing it the custom settings apply to the native ad view right after it gets initialised. More information about the native ad template can be found here. Native ads can be easily integrated to tableviews, as the Audience Network Framework provides additional tools for doing that. Of course, you are always allowed to create your custom native views and add them to tableview cells, but definitely the hassle is going to be greater. 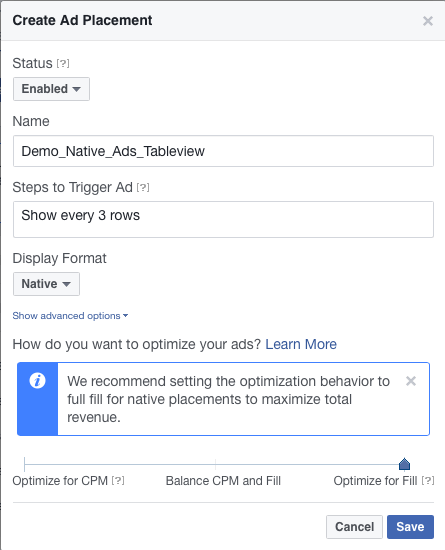 When dealing with ads and tableviews, then two new classes come into the play: The FBNativeAdsManager and the FBNativeAdTableViewCellProvider (details here and here). The first one is responsible for fetching a set of ads and managing them within the application. One useful feature of that class is the fact that it clones the ads that has fetched already, so they can be repeatedly shown in a really long tableview (and not only). The second class provides mechanisms in order to automatically integrate native ads to tableviews, like for example methods to create cells or to calculate row heights. Those methods are used in conjunction to the default tableview’s delegate and datasource methods. In addition to the methods that the second class provides, we’ll also use some valuable methods from the FBNativeAdTableViewAdProvider class that comes along with the FBNativeAdTableViewCellProvider. let adRowStep = 4 var adsManager: FBNativeAdsManager! var adsCellProvider: FBNativeAdTableViewCellProvider! The adRowStep indicates how often ads will be displayed in the tableview, and in our case ads are going to be displayed after three rows of normal content (each 4th row the tableview will show an ad). The other two properties are objects of the first two new classes mentioned previously. Next, we’re going to implement a new method. In this one, we’ll initialise the adsManager object, and we’ll load a bunch of ads to use in our tableview. The initialiser gets two parameters: The first one is the placement ID that you created earlier in the Facebook Developers portal, and now you have to fetch it and paste it here. The second parameter defines how many ads the manager will download, and the maximum value is 10. Obviously, there’s no need to initialise again if the adsManager has already been initialised, therefore we check if it’s nil or not. Before we call the loadAds() method of the FBNativeAdsManager class and trigger that way the downloading of new ads, we set the TableViewAdsViewController as the delegate of the ads manager object, because only through the delegate methods that we’ll define next the app can acknowledge whether ads have been fetched or not, and that’s also the point that we’ll continue from. For the initialisation we need to provide two arguments. The first one is the ads manager object that we used earlier, and the second is the native ad view type (FBNativeAdViewType) that we’ve already seen in the previous part regarding the template ad view. With it, we can set the height of the displayed ad, and according to what we know already there are four height values to choose from: 100, 120, 300 and 400 points. Make your tries and find what suits you the best. In addition to that, we make once again our class the delegate of the adsCellProvider so we can get notified about the actions made to the ads by implementing any delegate methods of the FBNativeAdDelegate protocol. Of course, that’s totally optional and you can skip it. There are more methods that you can optionally implement; just start typing “nativeAd” and Xcode will suggest them to you. Alternative, use the link I gave you back to the Showing Native Ads part and read the documentation of the protocol. Once again, I recommend you read the documentation regarding the FBNativeAdTableViewCellProvider and FBNativeAdTableViewAdProvider classes. But even without doing so, you understand that the above method adjusts the number of rows to the tableview, taking into account the ads that should be displayed too. By doing that, we avoid crashes that can happen when scrolling to a row with an index greater than or equal to the length of the sampleData array. If you think about that, instead of 20 rows (as many as the items in the array), we’re going to have six more rows because of the ads that will be added to the tableview, therefore it’s important to adjust the index of the array. Run the app now, and go to the second tab. Wait a few moments, and the ads will be displayed between the rest of the content in the tableview. Let’s declare now a property of the FBInterstitialAd class that will represent a full screen ad in code. If you ran the starter project at least once, then you’d have found a button that is supposed to trigger the presentation of the full screen ad. For this button, I have already created an IBAction method for it, so let’s add the missing code, the steps of which are quite similar to what we’ve seen many times so far. For the initialisation of the fullScreenAd object, we only need the placement ID that we created for the full ad specifically. So, make sure to get it and paste it in the first line above. The rest is easy. Notice that we disable the button once it’s tapped once, so we don’t make repeated ad requests. Notice that the button becomes enabled again. As usual, we just print the error and we enable the button in addition to that, but that’s a simple approach absolutely not recommended in real apps. I think that there’s nothing to comment here. Run the app now and go to the third tab. Use the button and wait to see the full screen ad being presented to the screen. For more information about full screen ads, take a look here. If you want to use banner ads in your app, then the FBAdView class and the respective FBAdViewDelegate protocol are your tools. Likewise to the full screen ads, all we have is to initialise a FBAdView object and load an ad, and after that to present it in the view controller. There are some things that change upon initialisation, but we’ll discuss about them. Now, in the loadBannerAd(_:) IBAction method, we have to initialise the bannerAdView object, and eventually load the ad. Keep in mind that we also have to specify the banner view’s frame. Three parameters are needed in this case: The placement ID matching to this ad (copy-paste yours here), the size of the ad, the the view controller that the add will be presented to. For the ad size there are predefined values that you can use, and you can find all of them here. What size you select depends on the requirements of your app, or the size that matches the best to the rest of the UI. Note that before we add the banner view to the main view, we hide it, and we’ll show it again once the ad has been loaded. And that’s all it takes to display a banner ad to your app. Run the app now, go to the last tab, and try it out. For more information, this is the place you should pay a visit. 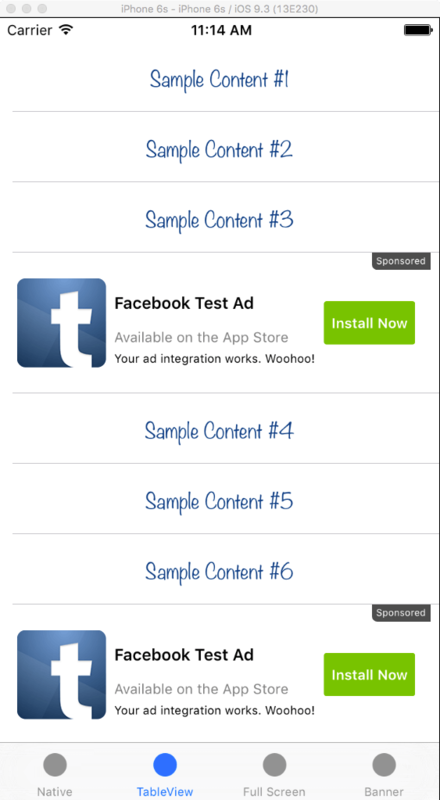 So, that’s all the possible options you have at your disposal once you decide to integrate Facebook ads in your apps. I think that there was nothing particularly difficult in any case of ads we met in the previous parts. What I presented in this tutorial is good enough to get you covered in most cases, but I have to say once again that you should definitely go through the official docs, because you’ll find details not mentioned here. 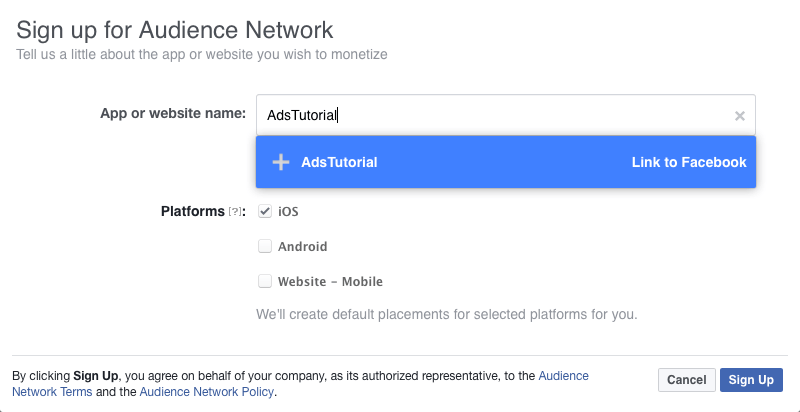 Knowing how to integrate Facebook ads using the Audience Network Framework is an advantage for every developer, and also consists of an extra option to make some earnings out of an app. In any case, I hope you’ve found this post interesting and that you’ve learnt something new today. That’s what matters at the end. Have fun with the ads! For the full Xcode project, you can check it out on GitHub.com. I know this is totally unrelated. I signed up for the FBStart program a few years ago. How long does it last? Where do I go to see if my account is still under that program? I was just trying to get the native ads in scroll view and i followed FB docs but no luck! @IBOutlet weak var viewAdContainer: UIView! @IBOutlet weak var lblAdTitle: UILabel! @IBOutlet weak var lblAdBody: UILabel! @IBOutlet weak var imgAdIcon: UIImageView! @IBOutlet weak var btnAdAction: UIButton! @IBOutlet weak var lblSocialContext: UILabel! My question is how to show nativeAd at specific cell in my auto dimension tableview/collectionview. the sample provide only method for each step as here adRowStep = 4. How could I insert to specific index ( in the 3rd and the last row of table for my case ). // In this example the ads are evenly distributed within the table every kRowStrideForAdCell-th cell. // For ad cells just as the ad cell provider, for normal cells do whatever you would do. // In this example we need to adjust the index back to the domain of the data. Having an issue where cellForRowAtIndexPath doesn’t line up with didSelectRowAtIndexPath. If you click a cell that is below the first ad it is showing the data from 1 cell below, if you click a cell that is below the second ad it is showing the data from 2 cells below. I am getting an error, it seems like it doesn’t recognize the header. Why can’t it find the file ?